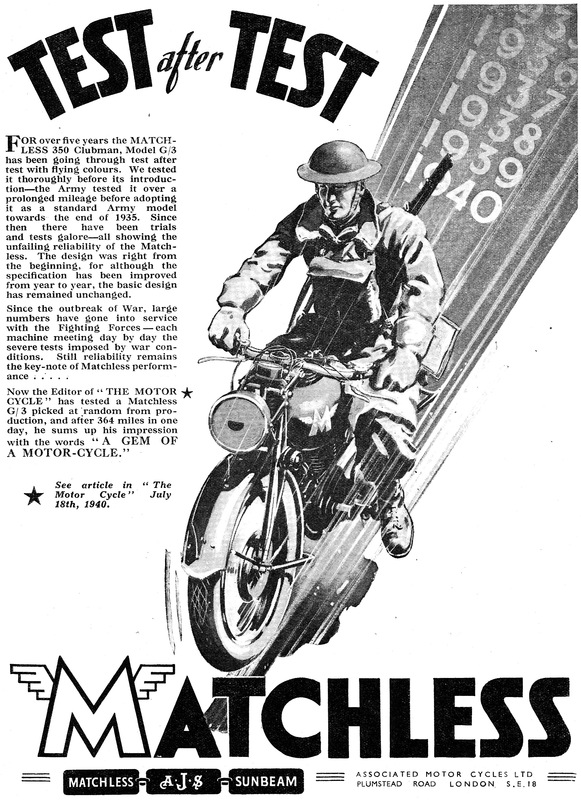 The AMC works produced two Matchless 350cc OHV single cylinder models for military use during the second world war 1939 – 1945. The G3-WO was essentially a pre-war Clubman modified to War Office (WO) specification. Although not especially sophisticated it was a very rugged well engineered workhorse. 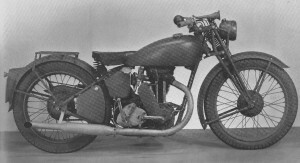 With features distinctive of pre-war machines – 1” handlebars, 8” headlamp, instrument panel-in-tank and girder forks – it adopted an AJS style front frame with single down-tube in place of the pre-war G3’s twin down-tube version. 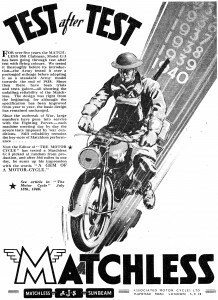 The motorcycle press of the pre-war / early wartime period continued to promote a strong interest in competitive motorcycling in all its guises, trials especially. 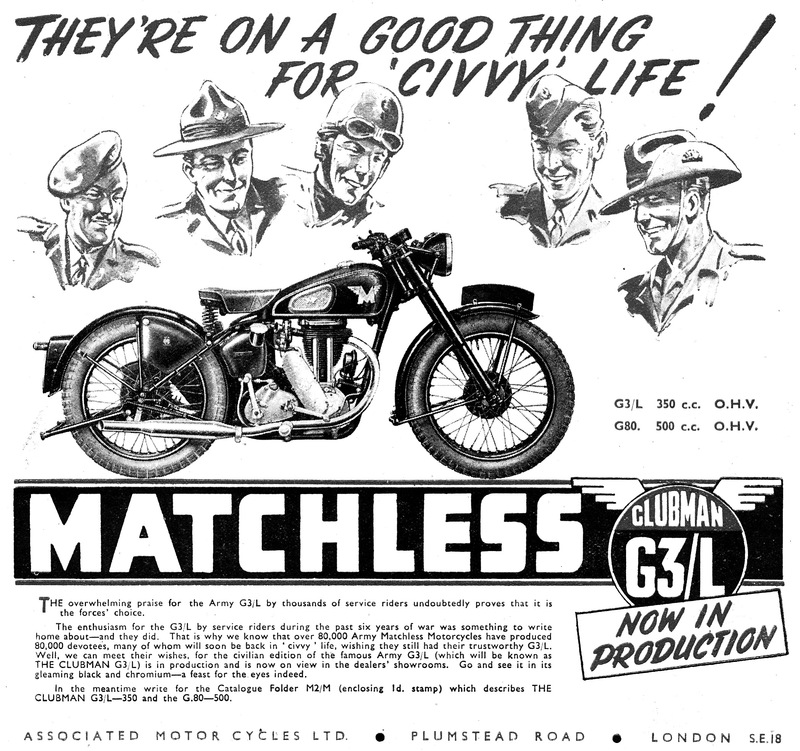 The Matchless factory was at Plumstead, London. 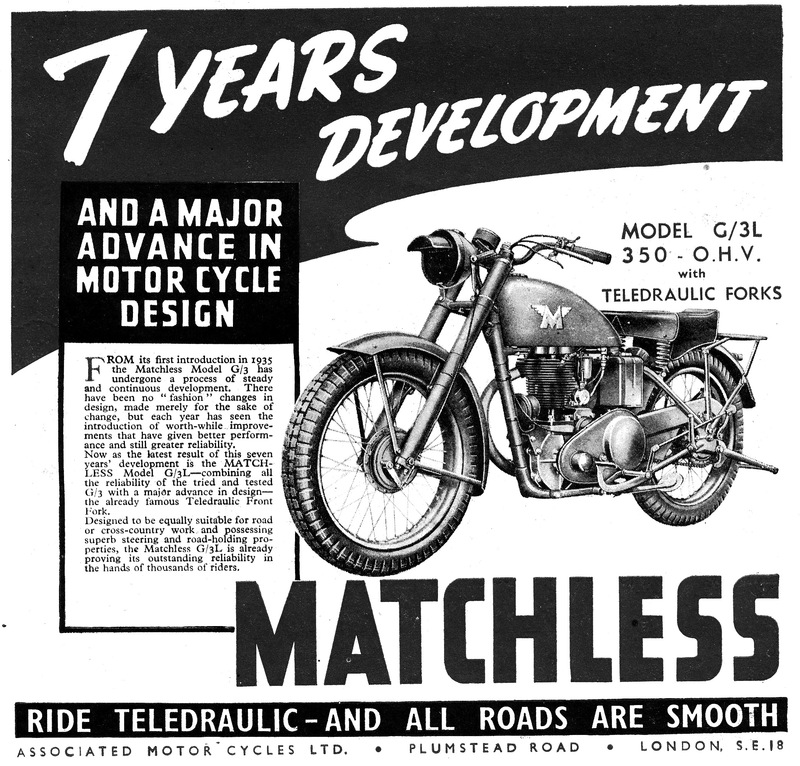 At the end of 1937 the company re-registered as Associated Motor Cycles Ltd. It was run by the Collier brothers who were themselves keen motorcycle competitors. Elder brothers Charlie and Harry had had TT wins in 1907, 1909 and 1910. 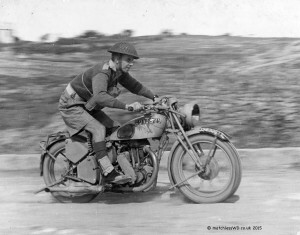 Fred Neill, former chief tester, rode in the 1923 TT as well as competing as both trophy and vase team member in ISDT events. Jock West, who later joined the AMC group, had worked for AFN Ltd who held the UK agency for BMW cars and motorcycles. His experiences with the BMW works racing team led to a set of telescopic front forks being purchased by AMC for evaluation . 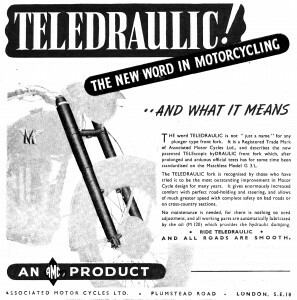 In his role as manager at Plumstead, the youngest of the Collier brothers Bert competed in scrambles events and was responsible for much of the pre-war design, especially that of the Teledraulic front forks. The design of the G3L was a product of this auspicious lineage. The design of the production G3-WO remained virtually unchanged, the biggest change being the removal of the instrument panel from the petrol tank. Associated to this change were a new petrol tank (removal of the instrument panel meant the tank was considerably easier to produce as there was now no need for the through-tank slot and no need for the instrument panel cut-out). The lighting switch was moved to the head lamp (and a blackout mask was fitted) and a new shell used which incorporated a panel for the switch and the newer, smaller diameter, ammeter, At the same time there was a change to the headlamp top stay. The early G3-WO contracts (c4608, c5427) also had a trip meter in the speedo head, ‘Nife’ alkaline batteries, Miller licence holders, and a Lucas N1 magneto (in place of the later N1-0, A-0 version). There were also other minor changes to the voltage regulator and the battery cover. All other changes (including the change from ¾” to ⅞” crankpin, associated flywheel changes, addition of timing side roller bearings etc) are essentially related to the change to model G3L and, even though some changes appeared in the last G3-WO contract c8934, these changes are enumerated later in the G3L paragraphs. Despite the relatively static G3-WO design behind the scenes it was a different story as the factory put its talents to meeting the War Office desire for lighter more nimble machines. Good ground clearance and off road performance, durability and ease of servicing were all desirable factors. The Army request was for machines weighing 70-100 lb less than standard W.D. machines at that time – giving the manufacturers a target of 250-276 lb according to size of machine . These target weights were later relaxed due to aluminium shortages. On the G3L cast-iron instead of alloy was used for the timing case cover and rocker box whilst the tappet inspection cover was replaced with one made of pressed steel. AMC were experimenting with a 250cc lightweight machine designated as the Model W40/G2D. This had a weight of 282 lb which was much less than the 375 lb G3-WO but heavier than the larger capacity 350 Triumph twin (263 lb) and the side-valve Royal Enfield (276 lb). Major savings were also intended by omitting the battery (c10 lb) and its carrier and suppling direct lighting from a small, light, alternating-current generator to a lightweight head lamp. 90% of battery material was imported and with the Japanese over-running many of our colonial rubber plantations this material became a scare resource. Outright speed was not encouraged and it is worth noting that the G3-WO was detuned as compared to the pre-war Clubman G3. It should be added that in part, engine detuning (for example fitting a smaller carburetter and lowering the compression ratio on the later G3L) was intended to create a more tractable engine that could run more efficiently on low grade pool petrol. The Service role of the motorcycle was mainly that of delivering despatches and escorting convoys . Later, around the same time that the G3L was supplied, and as part of its campaign to save ‘millions of gallons of petrol’, the Army stipulated that ‘officers up to the rank of Brigadier must learn to ride a motorcycle’ . It was also decreed that provision should be made for pillion passengers and that motorcycles should be used in place of the more petrol thirsty four-wheeled vehicles whenever possible. Prior to Dunkirk the motorcycle was principally regarded by many simply as a means of delivering despatches. Experiences at Dunkirk demonstrated how the motorcycle facilitated the rapid movement of troops across unmade ground, circumnavigating obstacles and terrain that would impede the passage of heavier four-wheeled vehicles. Peter Hartley in his excellent history of the Matchless motorcycle records that AMC developed a prototype 246cc (designated Model W40/G2D) which was tested at Farnborough in early 1940 with a view to it replacing the G3-WO. It seems that it did not meet War Department requirements and was not put into production. However, both the prototype 250 and the existing G3-WO 350 were to be superseded by the G3L. [‘Matchless’, Peter Hartley, Osprey Publishing 1981]. 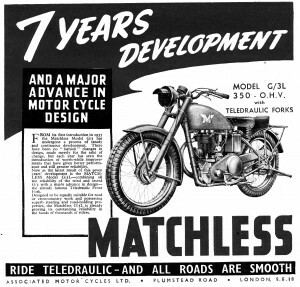 Although Matchless had previously been frustrated in bidding for sizeable (and lucrative) War Office contracts which had until now eluded them, this all changed in June 1940 when the Triumph factory was bombed. In the destruction was lost the batch of machines ready for despatch, together with the blueprints and tooling for what was to have been the Ministry’s preferred machine – the 3TW o.h.v. Triumph twin. The timing was catastrophic coming as it did in the wake of Dunkirk and the huge losses of equipment, motorcycles included. Immediately after Dunkirk there was a whip round the factories for motorcycles and an appeal to motor cyclists to sell their machines – thousands of them – to the War Office . 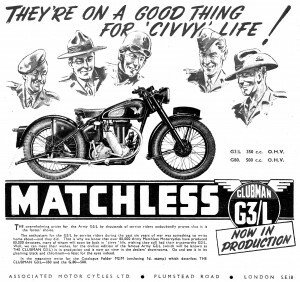 At least two prototype G3L’s were built and in early 1941 both ‘The Motor Cycle’ and ‘Motor Cycling’ were able to test them. Both magazines independently reported this testing in their May 15th, 1941 issues. 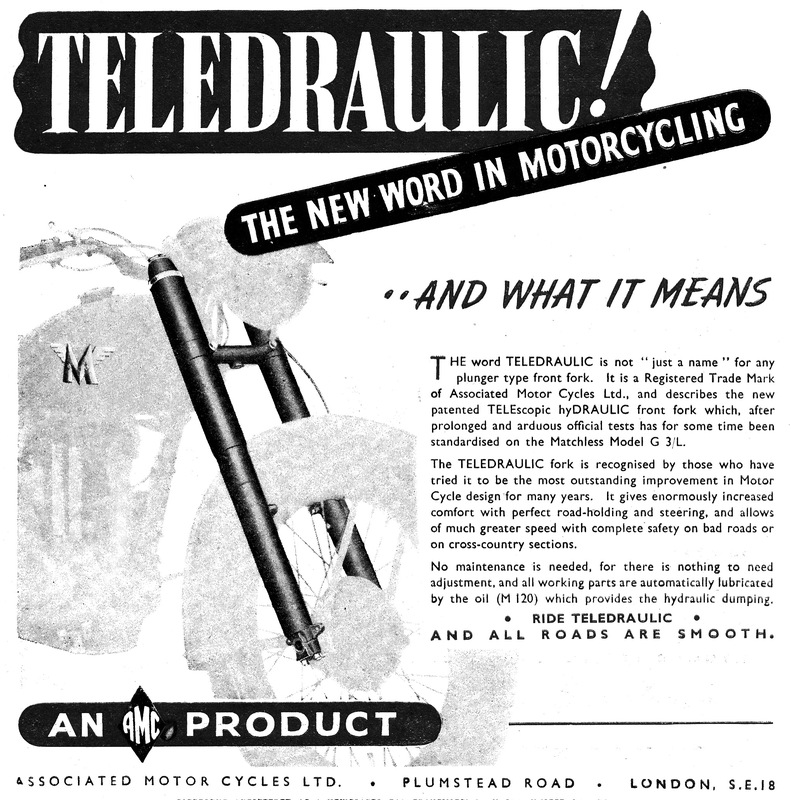 Common to both machines were the newly designed Teledraulic front forks. The girder forks of the G3-WO had only 2⅜” of upward movement (3⅜” total movement) – the new ‘Teledraulic’ forks, a first amongst mass produced British motorcycles, gave 6 9/32” total movement and pre-set the standard for post-war motorcycles. The fork trail was reduced to 1 15/16” against the G3-WO 2 ⅜”. There was little weight difference between the two fork types with the girders (at approx. 21 lb) being some two pounds lighter. The AMC factory was not the first British manufacturer to use ‘plunger’ type front forks on their machines. Norton for example used them on their 1938 TT machine. 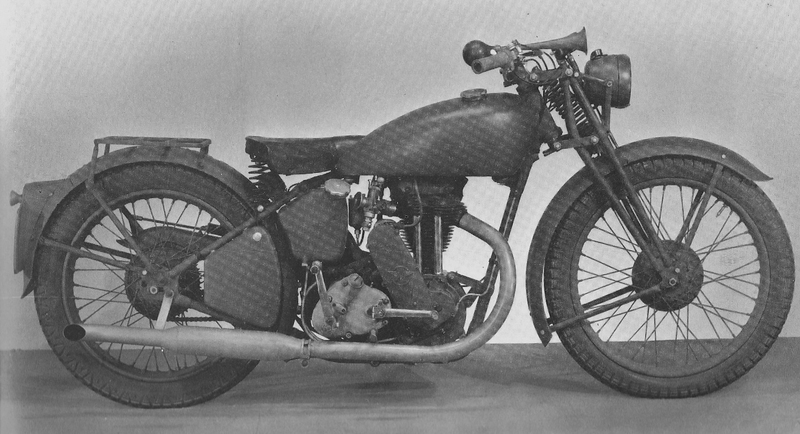 Although both Norton and Triumph wartime advertisements carried photos of ‘plunger’ type front forks AMC was the first to fit them in quantity on production machines. Each machine had a cut-down version of the G3-WO ribbed front mudguard with a lower stay replacing the front stand. The rear mudguard was also cut away which provided better clearance against mud-clogging and easier removal of the rear wheel. Both had G3-WO frames modified by the removal of the front sidecar mounting lug (which saved 10 oz of excess weight) and by removal of the extension to the bottom front lug which had previously given protection to the crankcases. A total weight saving was reported of some 56 lb – in addition to the frame modifications reducing the cylinder head and barrel finning saved 4 lb 10 oz, removal of knee grips and mounting plates 1 lb 14 oz, deletion of steering damper 1 lb 3 ½ oz, removal of one toolbox 2 lb 8 oz. Further savings were achieved in part by modifying the rear chain guard, removing the rear lifting handle, reducing the diameter of the front brake and modifying the front hub finning, perforations in the rear sprocket, improving the quality of the toolbox contents whilst reducing their weight, removing the front footrest rubbers, modifying the exhaust pipe and silencer and removing the finned exhaust clamp. Both prototypes displayed parts and modifications which were not adopted for the production G3L. The perforated rear hub was soon discontinued (perhaps the machinery and manpower required outweighed the small weight saving). GGP 869 had lighter and separate front engine plates of a style which first appeared in pictures of the Model W40/G2D prototype. Allied to this design change was the intention to have direct lighting (GGP was powered by a Miller 18w dynamo) as is evidenced in the photographs of GGP 869. As such, further weight savings could be gained by removing the battery, ammeter and the battery carrier. The article in ‘Motor Cycling’ speaks of previous consideration being given by the factory to fit an alternator but unfortunately this was not considered to be ‘good enough’ and no further detail is provided. However, the absence of electrical power when the engine wasn’t running meant that an electric horn was less viable (GGP had a rubber bulb horn) whilst the modifications to the front engine mounting also removed the platform on which the horn could be positioned. GGP was not fitted with provision for carrying a pillion passenger and indeed the fitting of its upswept exhaust system did not allow space for mounting pillion footrests. Incidentally: The upswept exhaust system returned to feature on an early post-war competition G3 . GGT on the other hand did have a pillion seat (the rear carrier having been positioned further back to allow space) and footrests but the footrests were a bolt-on to the G3-WO rear frame rather than having footrest mounting lugs brazed on as per the production version. Photographs of GGT show an electric horn on a standard front engine mounting so logic suggests that a battery and battery carrier were fitted to this particular prototype. GGP had a G3-WO petrol tank with indents knocked into it to allow full lock-to-lock steering movement of the teledraulic forks. The new G3L petrol tank (as fitted to GGT) was shorter and more rounded at the front which meant the indents were no longer required. The water deflector was also deleted. The two prototypes also had differing front head lights – GGT had an 8” head lamp mounted on a novel ‘stirrup’ type bracket which was bolted to an extension of the lower fork yoke. This did not reflect the mounting for the production machines which retained four mounting stays similar to the G3-WO but modified for the teledraulic forks. Conversely, GGP had a six inch Miller headlamp with switch and no ammeter. Both prototypes were very favourably reviewed. They approved of the increased ground clearance (5 ½”) and the lowered first and second gear ratios which were now 18.4:1 and 11.75:1 in place of the G3-WO 10.3:1 and 15.6:1. They commented favourably of the cleaner lines, the raised saddle height which had the dual benefit of lessening the chance of the saddle bottoming against the voltage regulator and of avoiding ‘tank top cascades reaching the rider’. The testers were especially impressed by the teledraulic forks and the smoothness of the ride they gave and looked forward to having a similarly sprung rear end! Despite initial evaluation of the G3L prototype in 1940, the first production G3Ls were not available until the latter half of 1941 and it wasn’t until 1942 that they were in widespread use . Throughout the war years the G3L continued to evolve. Some of the 56 lb weight that had been so painstakingly lost came creeping back on with the advent of rear panniers in late 1942. The valve timing was improved to give easier starting and the fork yokes and lugs were strengthened. A Vokes air filter was fitted to machines from the final contract. The single fuel tap was replaced by dual taps together with a modified fuel pipe assembly so that the tank – which had to be removed ‘for virtually all engine maintenance’ – did not now have to be drained. Wartime shortages required that the aluminium timing cover was replaced with a cast version and the rocker box was similarly treated. Shortages of Lucas components resulted in the use of those from Miller (various contracts). The changeover from the G3-WO to the G3L was the single greatest production shift and merited a change in name. Nevertheless, most G3-WO / G3L parts remained compatible to either model. Other changes were subtle and incremental but certain developments were more obvious than others; deletion of the panel tank, use of fabricated frame lugs, moving the lighting switch under the saddle, fitting panniers and Vokes air cleaners as standard are but a few.